I always read Melissa Clark’s column, “A Good Appetite,” in the New York Times Dining Section. 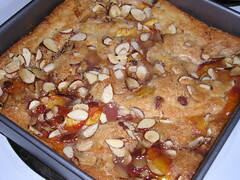 So I had to try her Brown Butter Nectarine Cobbler/Cake recipe, and the results were delicious. I used her alternate fruit, peaches, as I’d found some nice NJ Peaches the day before, and three big ones were perfect for this dish. No peeling necessary either! The recipe does require buttermilk, I never have it on hand without planning, but I do keep a little in the freezer. It loses its thick texture, but still does okay for baking. When I lived out west, you could buy a pint of buttermilk. Here I only find quarts, and I got tired of using a little and throwing out the rest eventually. So now I freeze it in one-cup containers. 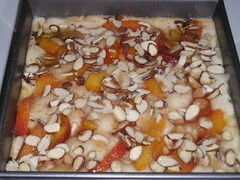 The finished dish is above, and the before and after photos of the dessert in the pan are below. What attracted me to this recipe was the “brown butter” component. I love just about anything made with nutty brown butter, and that flavor gave the usual cobbler a new lease on life for me. 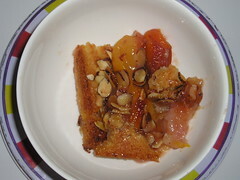 As Ms. Clark wrote, this was a cross between a cobbler and a cake, and that was interesting, too – I really like the cakey texture, and the sugary crust on top, with the crunchy browned sliced almonds guarantee I’ll be making this again soon!